I hope you all are doing pretty great. Last year when I was in India I only bought 4-5 Make-up products. I don't get Lakme products in US Stores; if we want to buy we have to either buy with eBay or Amazon but have to pay a very high price. I once bought a Lakme lipstick & lip-liner for which I paid triple of the original price & soon it got expired. Sometime I really miss the Indian brand products which I was easily getting in India. During my India trip last time, I was very excited thinking will buy so many beauty products but ended up buying only 4-5 products. One of them is Lakme 9 to 5 Weightless Mousse Foundation. I was very excited about this product as when it was launched I was in India & everyone was talking about this product. I got this product from NewU Store after 3 to 4 visits. It kept getting out of stock, I guess everyone is excited for this product. 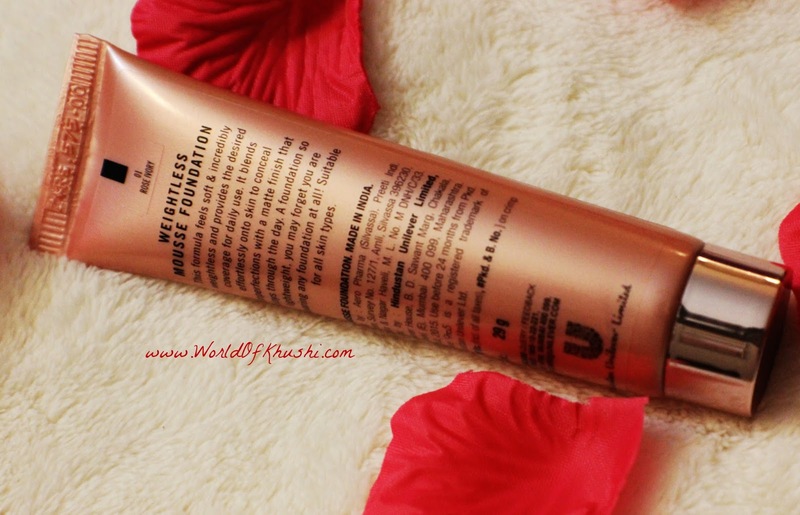 It comes in very beautiful Rose Gold Packaging in a tube which is travel-friendly. The texture is very-very Smooth just like velvet. It's pretty lightweight, you feel like you have nothing on your face. Very easily blend-able & Matte in finish!! When I tried this product, absolutely loved this. But after coming here my skin started getting very dry; special during winters. I tried this product but currently it is not working out for me; it keep enhances my dry patches. Maybe I will give it a try in summers again!! It's good product, specially if you have Oily to normal skin then this product is definitely for you. Lakme 9 to 5 WEIGHTLESS Mousse Foundation is your answer to a working women's barrier to using foundation. It is a lightweight foundation meant for everyday use. It is so lightweight that you won't even feel you are wearing foundation. It not only blends in effortlessly, but gives a matte finish that lasts through the day. It is available in 4 shades and it extremely convenient to carry. Step 1. Apply Lakme 9 to 5 Weightless Foundation to clean, moisturized skin. Step 2. Just take a small amount of product with the index finger and start applying it to the skin with your fingertips. Usually, you can just apply the mousse in four places: the forehead, nose, chin and cheekbones. Step 3. Blend into your skin starting from the center of the skin outwards, taking care to cover your face including your neck. I am having the shade 01-Rose Ivory. After applying Moisturizer! I take little product on backside of my hand & mix the product with my fingers to get smooth cream texture. Apply as dots all over my face & with the help of my fingers I blend it all over my face, sometimes I like to use a striping brush. It gives smooth finish with fingers more. 1. The texture is a very smooth. 2. Lightweight formula; you doesn't feel that you have foundation on. 4. Suitable for Sensitive Skin. 5. Act as a primer, fill skin pores. 7. Looks natural on face. 8. Easily blend-able; you can even blend this with your fingers. 9. 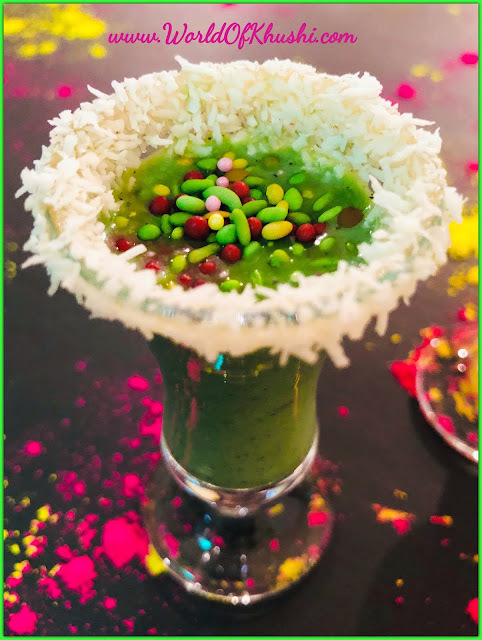 You don't need much product, pea size is enough. 11. Beautiful Rose Gold Packaging. 12. Packaging is travel friendly. 14. Stays for at-least five to six hours. 15. From price point it's good. 16. More like a BB Cream with advanced version. 1. Light to medium coverage. 2. Doesn't hide blemishes & dark circles. 3. If you have very dry skin & dry patches then it is not for you. 4. Enhance dry patches and wrinkles. 5. Only 4 shade options are available. 6. After few months starts getting dry & clumpy. 7. Doesn't provide ingredients list. You can give it a try, specially if you have normal to oily skin. In India Yes, Here No! I like this product!! But, if you're not living in India then you will get this from eBay or Amazon at a very high price. Instead I like to try any other foundation which is easily available here. I like to give it 4.2/5. This is good but not the best one. 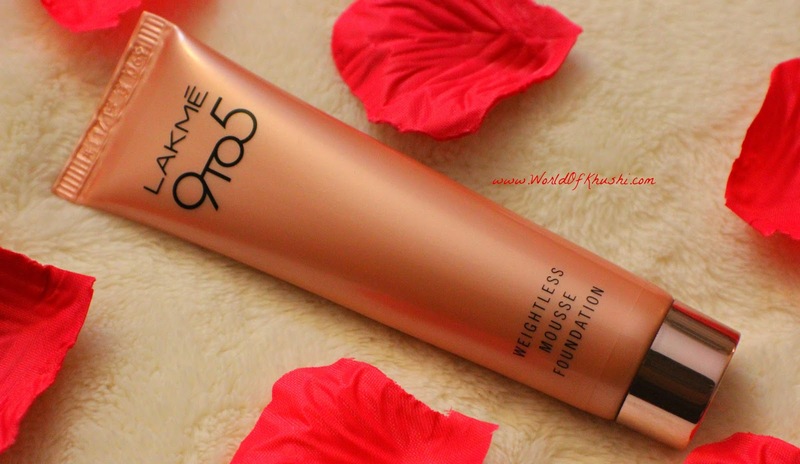 This is my full Review for Lakme 9 to 5 Weightless Mousse Foundation.